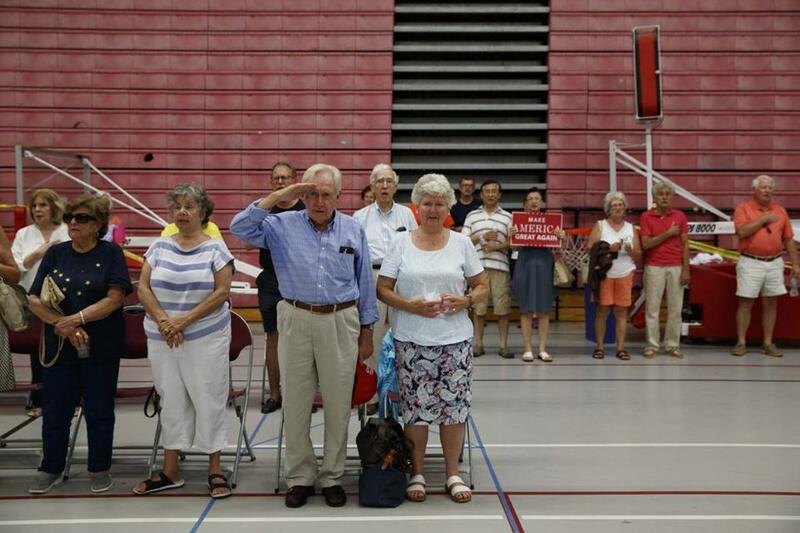 Donald Trump supporters stood for the national anthem during a campaign rally at Sacred Heart University in Fairfield, Conn., on Aug. 13. Of all the ways in which Donald Trump’s effect on the Republican Party is unlike Ronald Reagan’s, this may be the most telling: Younger voters were overwhelmingly attracted to the Reagan GOP, while the Republican Party led by Trump overwhelmingly repels them. 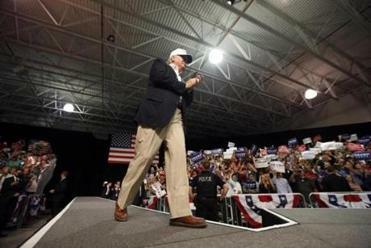 According to a poll of 18- to 34-year-old voters released Monday by USA Today and Rock the Vote, only 18 percent of millennials say they would vote for Trump if the presidential election were held today, compared with 50 percent who express support for Hillary Clinton. (Libertarian Gary Johnson drew 11 percent, and the Green Party’s Jill Stein was at 4 percent.) When asked about their party loyalties, just 21 percent of the millennial voters said they identify with the GOP; 50 percent — almost three times as many — put themselves in the Democratic camp. Other polls put Trump’s support even lower. In a Marist survey conducted the first week in August, a mere 9 percent of voters under 30 said they favored the Republican nominee — putting Trump far behind not only Clinton (41 percent) and Johnson (23 percent), but even Stein (16 percent). When respondents were pressed to choose one of the two major-party nominees, Clinton’s support among young voters rose to 53 percent. Trump inched up to only 17 percent. Such a gaping disparity in youthful support can’t be explained by Trump’s controversial proposals. Reagan’s views generated controversy too, yet young voters loved him. The Gipper won them over less with his policies and issues than with his authenticity and modesty and optimism. Trump has charisma aplenty, but it’s the charisma of the showboating huckster. Nothing he says comes from the heart; it’s all just part of the act. For young people, not yet jaded and hungry to be stirred, nothing could be less appealing. The race for the White House is likely to tighten as November approaches — Trump predicted Thursday that when the final votes are counted, we’ll be calling him “Mr. Brexit” — but at this point it would take divine intervention to repair his standing with the young. Trump’s numbers among millennials have been consistently terrible. In March, pollster Frank Luntz asked 1,000 voters under the age of 27: “Of today’s major political figures, who do you like and respect the most?” Bernie Sanders was the choice of 31 percent; Trump was named by only 9 percent. Queried on their political affiliation, 44 percent of the respondents called themselves Democrats. How many were Republicans? Fifteen percent. Is Donald Trump alienating young Republicans? Trump is losing millennials in droves, recent polls show. What does it mean for the party’s future? Such weakness for a Republican presidential ticket among the electorate’s youngest cohort is unheard-of. Barack Obama was enormously popular with twentysomethings, but his Republican opponents — John McCain in 2008 and Mitt Romney in 2012 — still managed to attract roughly one-third of the youth vote on Election Day. And in 2004, George W. Bush carried 46 percent of younger voters. During a campaign appearance at the University of Chicago four years ago, Romney lamented that he wasn’t doing a better job of “connecting with young people across the country.” Yet compared with Trump, whose disconnect from young voters is without precedent, Romney was practically a Snapchat sensation. But to really get a sense of the damage Trump has inflicted on the Republican brand, glance back to the 1980s. In 1980 and 1984, the GOP’s nominee was an inspiring, sincere, and upbeat conservative, and a tidal wave of young voters surged to join him. Eighteen months later, with Reagan’s presidency in its sixth year, there was no sign of Gipper fatigue among the young. On the contrary: The Philadelphia Inquirer reported that his approval rating with voters under 25 was a stunning 79 percent. So intense was Reagan’s popularity that it swept his chosen successor, George H.W. Bush, into office — the last time a two-term president was succeeded by the nominee of his own party. The Reagan magic didn’t permanently transform the GOP into the party of the young. 1988 was the last time a majority of the under-30 vote went to the Republican nominee. But voters who came of age during the Reagan era werepermanently transformed. To this day, those whose first votes were cast when the Gipper was the face of Republicanism remain the cohort most likely to lean Republican. Reagan — an honest, gracious, thoughtful, cheerful, and competent leader — imprinted legions of young followers with an enduring affinity for Reagan’s party. Trump is on track to do the opposite. A crude, shallow, sneering dissembler, he is driving young voters away from the GOP at record-busting speeds. In nominating someone so boorish and unprincipled, the Republican Party has woefully tarnished its reputation, above all with the young, whose political involvement is just starting. They are forming their first impressions of what it means to be Republican, and what it means for many of them is: Donald Trump. For decades to come, the stench of the 2016 campaign will affect those voters and mold their political leanings. Every poll shows young Americans fleeing from Trump and his party. If history is any guide, most of them are never coming back.